People can grasp the concept of a dog show. But people cannot grasp the concept of a cat show. This is the film, CATWALK’s premise and mission to put cats on the film map just as the successful dog show film BEST IN SHOW did for canines. One difference between BEST IN SHOW and CATWALK should be noted. BEST IN SHOW was a mockumentary that followed 5 different dogs with their owners as they showed off their dogs in different shows while CATWALK is a real documentary. This does not mean that a real documentary is less funny that a mockumentary as the film occasionally proves. The film takes a distraction with a segment on Kim taking scuba diving lessons and having a new group of friends she considers her family. There is no purpose this segment serves with regards to cats except as a time filler. CATWALK runs at a brisk 75 minutes. 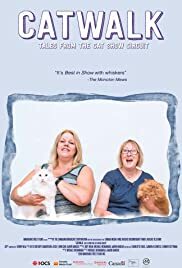 The film interviews two main cat owners/exhibitors and a few breeders while featuring a few of the show’s judges. The main owner is Kim Langille who shows off her pride a white Turkish Angora. Kim is also a show organizer and her enthusiasm for cats rubs off n her audience. She as a wise pick to be the doc’s main character. The other is her competitor, Shirley McCollow who spends hours grooming her Red Persian for the show. There is a sweet moment of an autistic cat owner who overcomes her disability by devoting her efforts on her cat. CATWALK is made more colourful by the titles that appear on screen, one on purple or green or orange background. CATWALK the film does not offer any advice to cat showers or messages for the audience. (Oh, maybe just one message from a cat breeder: Good things come to good people who do good things.) It is just an entertaining fun picture about cats, even for non-cat lovers like myself.